WASHINGTON (Jan. 21, 2009) -- Soldiers, Sailors, Marines, Airmen and military spouses attended the Commander in Chief Ball, Jan. 20, at the National Building Museum in Washington, D.C. The event -- one of many surrounding the 2009 presidential inauguration -- featured food, dancing, and performances by musicians Jon Bon Jovi and "American Idol" Jordan Sparks. Attendees at the ball included servicemembers from both the active duty and reserve components as well as members who had been injured in the War on Terror. 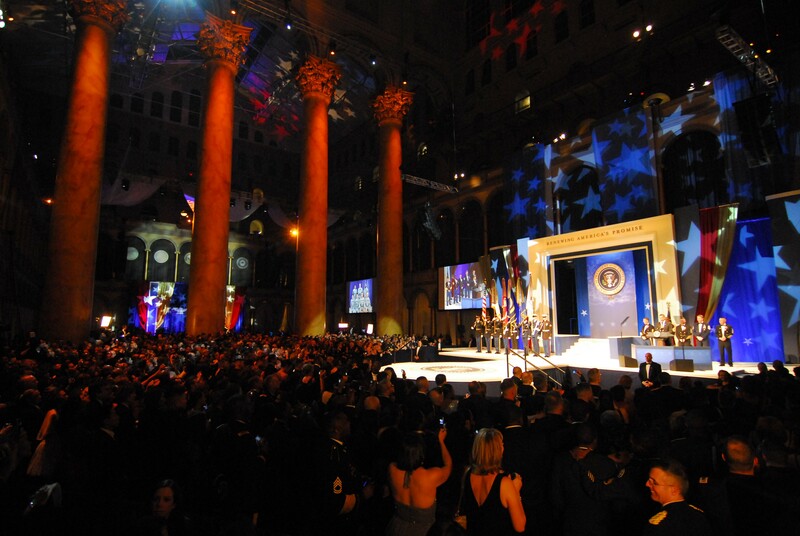 Soldiers, Sailors, Marines, Airmen and military spouses attended the Commander in Chief Ball, Jan. 20, at the National Building Museum in Washington, D.C. During the ball, President Barack Obama told military members he was proud of their service. "It is wonderful to be surrounded by some of the very best and bravest Americans," Obama said. "Know that as president I will have no greater honor or responsibility than serving as your commander in chief." The ball was one of 10 attended by President Barack Obama and Vice President Joe Biden. Obama's address to attendees at the ball was the first time he was able to directly address such a large audience of military members as president. For servicemembers, it was the first time they had been directly addressed by their new commander in chief. "It is wonderful to be surrounded by some of the very best and bravest Americans," Obama said. "Know that as president I will have no greater honor or responsibility than serving as your commander in chief." The president said that even while attendees at the ball were enjoying an evening of festivities, there were members of the U.S. military around the world that were in harm's way. He also said service and sacrifice are not limited to those in uniform. "Every time a servicemember deploys, there is an empty seat at the table back home -- and a family that has to bear an extra burden," the president said. "That's why Michelle has spent so much time in the last few months working with our military families. That's why tonight, we don't just salute our troops, we salute the military family that has earned the respect of a grateful nation." The new president also told servicemembers that he is grateful for the work they do for the United States and that they have the support of his administration. "Going forward, you will have our support and our respect," he said. "You will have a great secretary of Defense in Robert M. Gates, you will have a great secretary of Veterans Affairs in General Eric Shinseki. And every single day that I am in the White House, I will try to serve you as well as you are serving the United States of America." During his time at the ball, the president also spoke via teleconference to Afghanistan with Soldiers deployed there from the Illinois National Guard's 33rd Infantry Brigade Combat Team. He told those Soldiers he was proud of their service. Sgt. Luis Rosa-Valentin is a wounded Soldier now assigned to a Warrior Transition Unit at Walter Reed Army Medical Center. He was part of the 4th Infantry Division, 1-66 Armor Regiment when he was injured in Iraq in April 2008 -- just days before his 25th birthday. He and his wife of five years, America, attended the ball together. "This is actually really cool," Rosa-Valentin said of attending the ball. "There's some big names here and I'm looking forward to seeing what happens. Seeing the president will be the best part of this tonight, as I am truly interested in hearing what he has to say." His wife, America, was interested in knowing what the new president will do with Soldiers now in Iraq. "I'm more interested in seeing what Obama has planned with taking them out," America said. "You know, I'm wife to an injured Soldier as well as a friend to a widow. I know both sides of this: being the wife of an injured Soldier and my best friend's husband was killed in Iraq. I want to know what he has in store for the troops. Will he take them out?" Sgts. Rudolfo Agustin and Jeremy Sandoval both work at Walter Reed Army Medical Center in Washington, D.C. The two, along with Sandoval's wife, Jasmine, attended the ball together. "We met Barack Obama yesterday, at Walter Reed," Agustin said. " He came by on an unscheduled visit to see wounded Soldiers." "He wasn't even sworn in yet, and yet he was still making the effort to come see the guys who were wounded," Sandoval said. Sgt. Maj. of the Army Kenneth O. Preston was one of five service senior enlisted advisors to attend the ball. He said that the ball, now being held for the second time, is an honor for all servicemembers. "It is a great honor, the CINC Ball, as it showcases all our servicemembers -- recognizing them for their service, sacrifice and contributions," Preston said. "We brought in a big group of wounded warriors from Walter Reed, Bethesda and the Military District of Washington area -- this is an opportunity to honor them and their service." Preston also said that while the ball is part of the inaugural celebration, it is not a display of politics for the military, because the armed services are apolitical. "Regardless of what political party the president comes from, when he or she is sworn into office, they become the commander in chief of military forces," Preston said. "And by our constitution, it is our civilian leadership that is in charge of the military. That's the beauty of our country, of our military -- what you saw today at the inauguration was a peaceful transition of power from the outgoing president and political party to an incoming president and political party. But from a military perspective, you will see no change in operations or command and control -- the Army, as our song goes, the Army keeps rolling along."